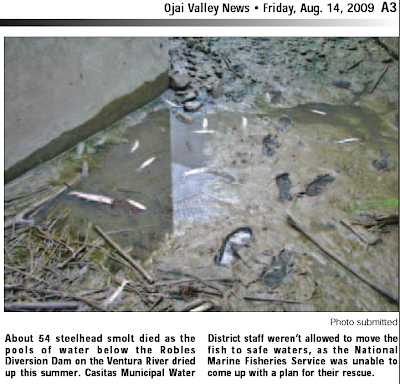 Your article By Paul Sisolak 08/27/2009 incorrectly portrays the beach restoration project at Surfers' Point as impacting coastal access. This is unfortunate, as the project was designed specifically to ensure continued beach access. In fact, although there are almost unlimited parking spaces in the adjacent fairgrounds, beach access has always been one of the primary issues regulated by the Coastal Commission. According to the plans approved for the first phase of the project, only the upper portion of the existing beach parking lot will be removed, most of which is currently unused due to the damages caused by erosion more than a decade ago. During this phase there will actually be more parking than there is currently, since the new parking area in the fairgrounds dirt lot will be improved for daily use in addition to the remainder of the current beach parking. The Coastal Commission permit also requires that all work must be done during the winter season to avoid the ‘peak’ summer season and annual County Fair events. 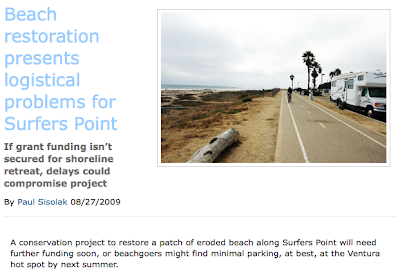 The Surfers' Point Managed Shoreline Retreat project has been designed to undo the mistake made 20 years ago when the shoreline was graded and filled to provide for a bike path and parking lot. This was approved at the time, despite objections from locals who had witnessed the previous failed bike path and understood the dynamics of this beach formed by the Ventura River and shaped by large winter swells. Managed retreat will not only restore the natural ability of the beach to adapt to the forces of nature, but also give back to Ventura a beautiful beach by the rivermouth as envisioned by our benefactor EP Foster in the early 1900’s. THANKS to the volunteers came out on Saturday to assist with the cleanup of the paintball site. "What an excellent turn out with major progress last Saturday. There were 23 on the sign in sheet. By the end of Tuesday we may have hauled a majority of the materials away. The tree house will be removed by Rick Bisaccia, Ojai Valley Land Conservancy. County Work Release Program will be there again assisting the City's Distribution equipment operators with the loading operations. The remaining challenge is the paintballs. We have an industrial truck mounted vacuum that might work well." 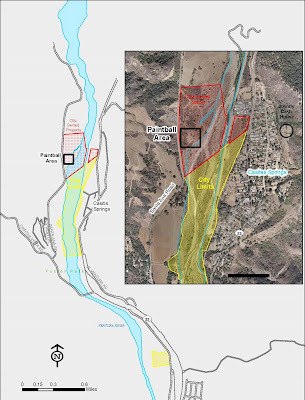 The Steelhead Population and Habitat Assessment in the Ventura River / Matilija Creek Basin studies are part of ongoing research effort to provide baseline data of the current population and advance the understanding of this species, which is endangered in Southern California. 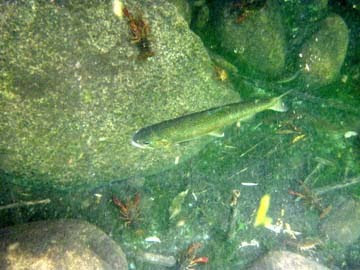 Although the recent news has not been positive (see steelhead-die-as-river-dries-up,) this annual monitoring has seen continued productivity within the watershed. 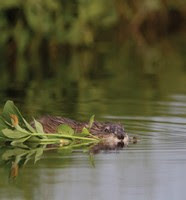 Past reports are online at matilijadam.org and the recent data will be available once the reports are completed. 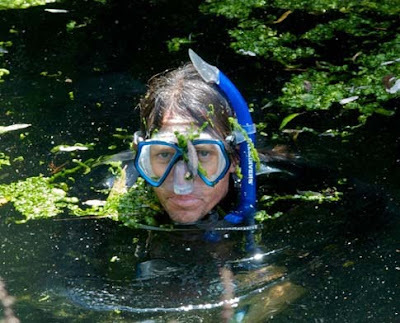 After snorkling with the TRPA biologists last week, I returned with local biologist Matt Stoecker and his camera equipment to document the fish we are seeing this year... These pictures are courtesy (and copyright) of Matt. 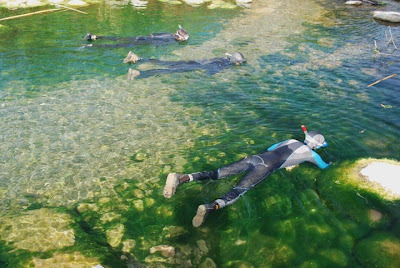 If you would like to help support this program, this year's Patagonia 'Salmon Run' event along the Ventura River will benefit the Matilija Coalition and the ongoing steelhead monitoring. 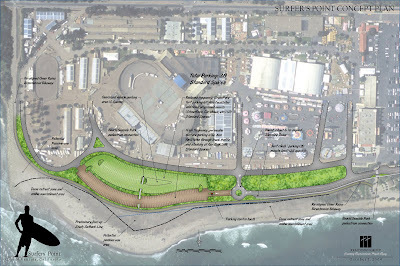 The City of Ventura this week gave the go-ahead for the Surfers' Point Managed Shoreline Retreat project. The passage of the state budget allows the previously earmarked grant funding to be released in time to break ground this year. Construction of the first phase of the project should begin in November 2009. The Ventura City Council this week approved three major improvement projects, including the first phase of a multimillion-dollar plan to relocate a decaying bike path and restore the beach near Surfers Point and the Ventura County Fairgrounds. 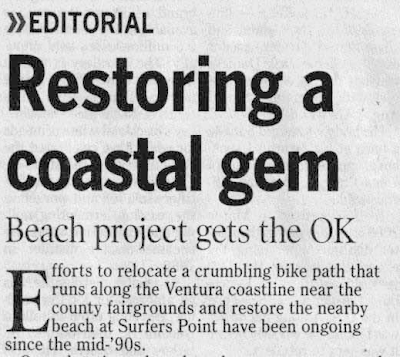 ...Coastal watchdogs, outdoor enthusiasts and community leaders have been working on a campaign to relocate and replace a crumbling bike path along Ventura’s coastline for 15 years. Construction of the initial $3 million phase, to be paid with one-time grants, could begin in November or December. The restoration effort has been hailed as a model environmental approach to stabilize and restore 1,800 feet of beach near the fairgrounds. The project will relocate the bike and pedestrian trail and parking lot on the ocean side of Shoreline Drive about 65 feet inland toward the fairgrounds. Once the path and parking lot are relocated, several tons of cobblestone will be spread at water’s edge, adding to the rocky shoreline. Sand then would be laid over the cobblestones to help restore the area to a more natural beach habitat and prevent future erosion. A portion of Shoreline Drive will be shortened as part of the project. The second, unfunded phase of the project would include a new parking lot and picnic areas at the fairgrounds. The California Coastal Commission unanimously approved a necessary construction permit in 2006. “This is a groundbreaking project,” in using nature’s own patterns to protect the beach, said Lawrence Manson, who helped create the Surfrider Foundation’s Ventura County chapter. Initially projected to cost a few million dollars, construction costs have ballooned to $9 million because of rising materials costs and added public amenities. Because the grant funds must be spent by the end of the year or possibly be forfeited, supporters explored a phased approach. Ventura was unsuccessful in its bid for $5 million in federal stimulus funds to help complete the project. 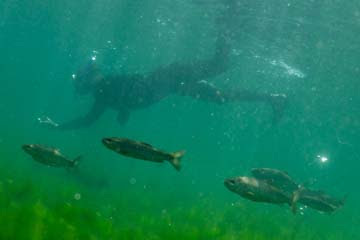 A Wall Street Journal opinion piece in December put the beach restoration plan on a list of “shovel-ready” proposals it dubbed as unworthy for federal stimulus funds. Other requests it said were frivolous included $1 million to upgrade the Los Angeles County Convention Center elevated “catwalk” with cameras and lighting; $350,000 for an Albuquerque, N.M., fitness center; $94 million for a parking garage at the Orange Bowl in Miami; $3.1 million for a swimming pool in Tulsa; and $80,000 for a tennis facility in Santa Barbara. Councilman Brian Brennan said the editorial’s authors likely didn’t take the time to understand the Ventura plan. “This may be frivolous sounding in name, but this is a well-respected project,” he said, noting that since the editorial was published, coastal cities in North Carolina and other states have called Ventura wanting to learn more.